The Object Project is a group show that will feature the work of fifteen artists who have joined together in an endeavor to explore their varied and unique approaches to the same five objects. Each of the participants approach their art with a 21st century mind-set. The exhibition will travel to five museums over 2 years. These museums include the Evansville Museum of Art, History and Science, Evansville IN; the Philbrook Museum, Tulsa, OK; the Greenville County Museum of Art, Greenville, SC; the Hunter Museum of American Art, Chatanooga, TN; and the Museum of Outdoor Arts, Englewood, CO. 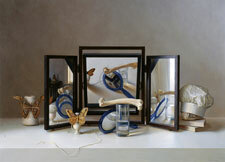 The artists have each executed two works in which five common objects have been utilized between the two pieces. For the purposes of this exhibition, a cooperative was formed in which the artists selected objects for a ballot and voted for the final five. The vote resulted in: a clear glass of water, a moth, a ball of string, a bone, and a hand mirror. These common objects have been a starting point for each artist to allow themselves free rein. They were allowed to alter, age, mar, obscure, or add to the objects just as long as all five were utilized. Many of the participants have had friendships for years, while others have become friends as a byproduct of this group. The Object Project has allowed artists who have known each other's work for years to finally meet, exchange ideas, encouragement, and inspiration. The prospect of this shared body of work that reveals everyone's unique artistic visions is very exciting. Participants include: Steven Assael, Michael Bergt, Debra Bermingham, Deborah Deichler, Rob Evans, Scott Fraser, F. Scott Hess, Robert C. Jackson, Janet Monafo, Pamela Sienna, Daniel Sprick, Skip Steinworth, Nancy Switzer, Jeff Uffelman, and Will Wilson. A catalog will be produced in conjunction with the show.